First up, I created a simple website that has a predefined set of quotations and then on the default page, I randomly display a quote. This is very simple because here we are not concerned about the business logic but about how Azure publishing works. First we need to create an account at windows.azure.com I have a MSDN subscription so I already have an account. Then on the management portal, we create a "new Hosted Service" and set some simple properties such as name and location. Instead of choosing location, it is better to choose an affinity group. An affinity group means that all the servers/VMs will be located in the area that we select as an affinity group. Once this is done, we create a certificate to ensure that only those who have this certificate are allowed to publish. 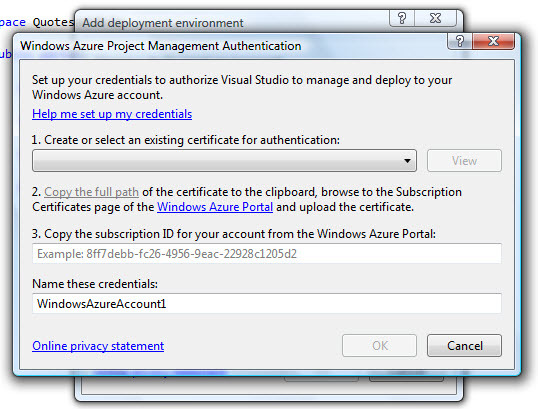 We create this cert in VS by going to server explorer and then right-clicking the Windows Azure Compute tab and selecting "Add Deployment Environment". In this tab, we right click again on "Windows Azure Accounts" and then clicking "New". Then we go back to the management portal and navigate to "Management Certificates" tab. Here we click the "Add Certificate" button. Here we can copy the path that we copied in the previous step and finish adding the certificate. Once the cert is added, in the management portal on the right side you will see that an subscription ID is generated. Copy this subscription ID and go back to VS and paste the id in step 3. Give this cert some name and click OK.
Now go back to Management portal and click on Storage accounts and then click on New Storage account. Create a new storage account by choosing the same affinity group as chosen above. Its not required but its a good practice to have your storage and app VMs to be near to each other. Once this is done, we are all set up to publish our solution. Right click on the windows azure project and click on publish. This will open up an window where you have to select the Credentials, Deployment environment and storage account. All of this, we just created in the steps above. Once this is done, click on OK and publishing will start. The publishing takes some time because Azure is actually getting all the instances ready for publishing and then publishing the code out to them. Once the publishing is done a website URL is provided for you to access your website.